Easter is one of the most important day for Christians. 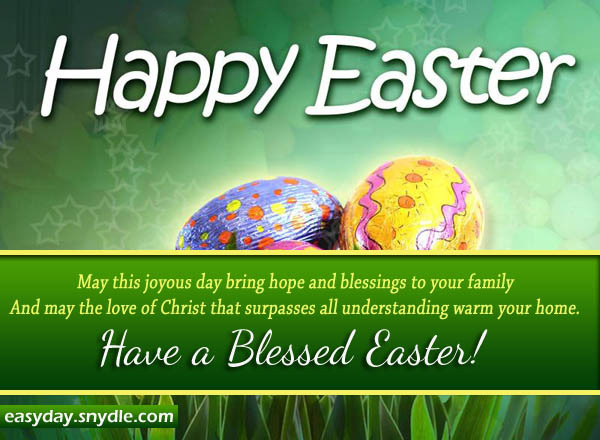 Easter Sunday commemorates the day when the Almighty Jesus Christ resurrected from the dead. 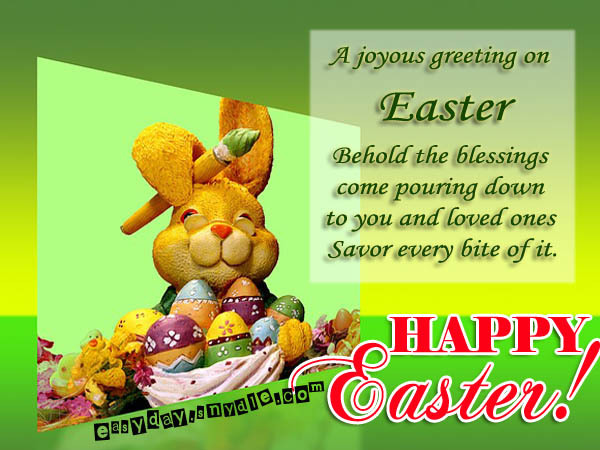 Giving Easter cards is one of the most heartfelt way of sending your Easter greetings and wishes to your family and love ones. Sending Easter wishes greetings gives you the opportunity, not just to rekindle your bond with God and your family, but also spread the inspiration that the spirit of Easter gives. 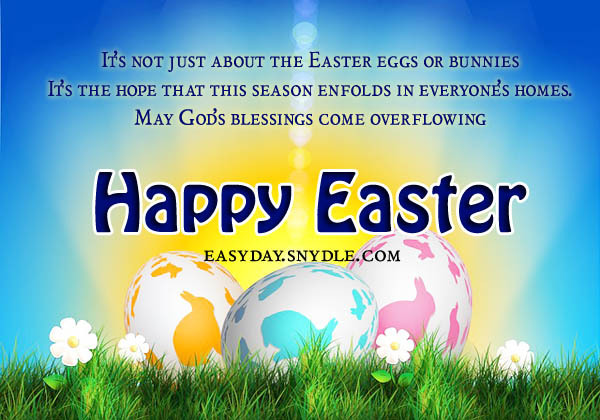 Here are some of the best Easter messages and greetings that you can write on your Easter cards, whether it is the traditional paper-made card or electronic card. 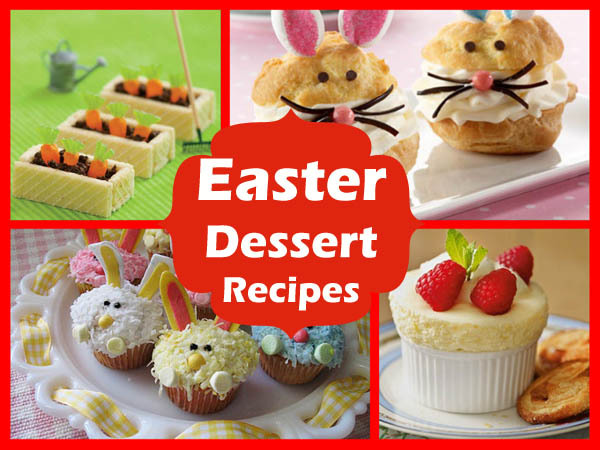 Greet your family and friends a Happy Easter in this important occasion using these Easter wishes samples. We have wrote and compiled some of the inspiring and heartwarming Easter wishes messages for your loved ones and dear ones. Feel free to use them on your greetings and sms. And may the love of Christ that surpasses all understanding warm your home. This is what the love of God has done in me and you. 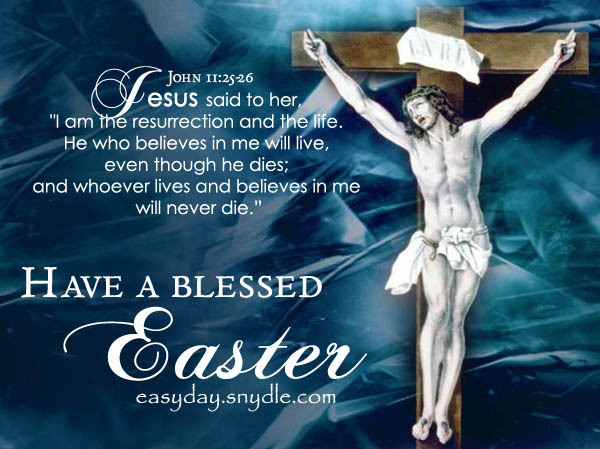 Do you want to keep your Easter wishes and greetings a religious one? 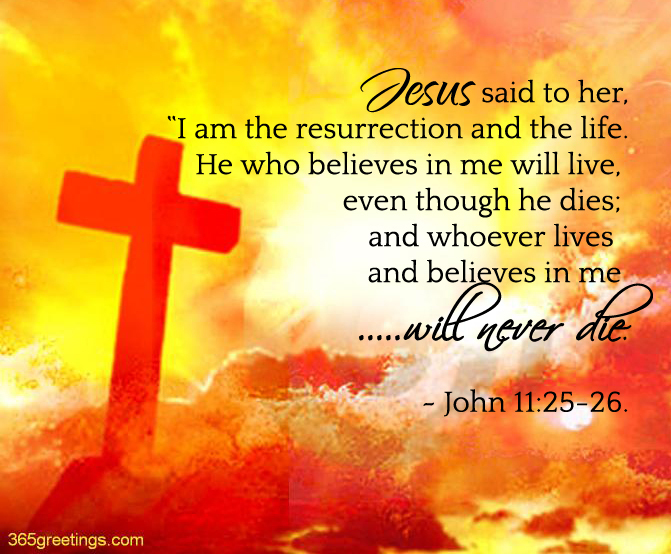 Don’t worry as we have here some samples of Christian easter messages that you can use. 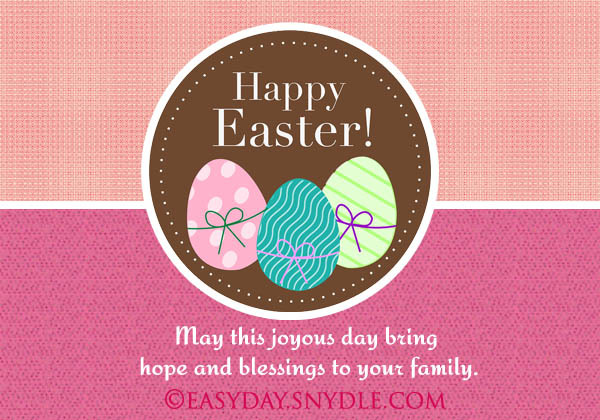 These religious Easter messages are perfect for those who have religious-themed cards and greetings. Don’t be shy to use some of these message samples. It’s all because Christ, our Savior, lives. That while we are still sinners, Christ died for you and me. In Him, we could rest our hope upon. If you don’t know what to write in an Easter card, no need to worry anymore. Here, we have compiled some of the best Easter card verses that you can write and use. These easter card messages are kept heartfelt and inspiring to give inspiration to your recipients. Happy Easter everyone! 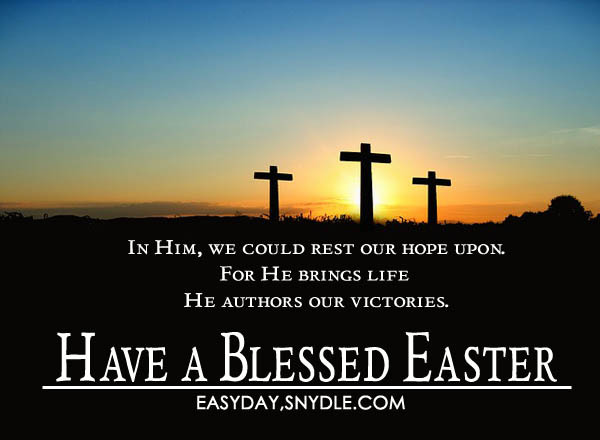 Have a blessed and fruitful Easter to you and your family! Enjoy it well with your friends, family, and loved ones so near. Easter reminds us that God deeply loves us. I’m so happy I could celebrate this day with you. Now, I don’t have to be so blue. God’s love remains the same. God all for His blessings! May God’s grace abound sweetly upon you and our family. I wish that everything will go well with you. And this is the promise which He Himself made to us: eternal life. For if the dead are not raised, not even Christ has been raised; and if Christ has not been raised, your faith is worthless; you are still in your sins. Then those also who have fallen asleep in Christ have perished. If we have hoped in Christ in this life only, we are of all men most to be pitied. But now Christ has been raised from the dead, the first fruits of those who are asleep. Who says Easter messages and wishes have to be serious and religious? 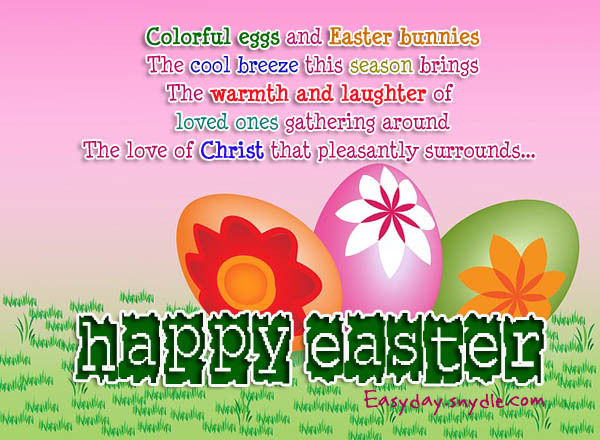 You can also use funny Easter greetings to greet your friends and give them a smile this coming Easter Sunday. It’s a celebration for the savior has risen so it’s not that bad to have fun a little bit. Here are some Easter funny messages and sms to consider. Greeting you a happy Easter! It’s better than a grinning Easter bunny right? I don’t understand the relation between the egg and the bunny. I wish you Happy Easter still! Eat all you can for free! Eggs all you can for free! If u can find them all.